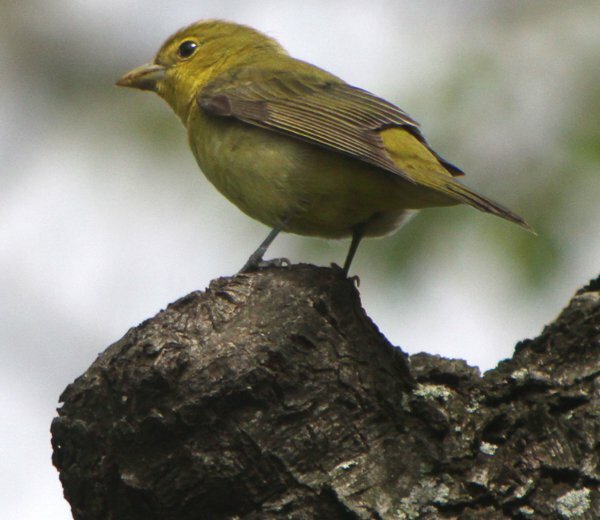 No one pays attention to female Scarlet Tanagers. Decked out in muted shades of green and yellow the best that can be said about their plumage is that it enables them to blend into the forest canopy, an aid in avoiding predation. This is in sharp contrast to male Scarlet Tanagers in red and black which are invariably described with words like striking, brilliant, and amazing. Yes, the female Piranga olivacea got the short end of the stick as far as colors go but despite the lack of brilliant coloration they are not unattractive birds. This female bird was spotted in Brooklyn, New York’s Prospect Park on the last day of April, 2011. She foraged in trees and bushes from five to thirty feet off the ground in front of me for at least ten minutes while I struggled to track her with my digiscoping rig. Sadly, I missed the short-range shots of her feeding in a flowering tree, a miss which would have been far worse had it been a male. 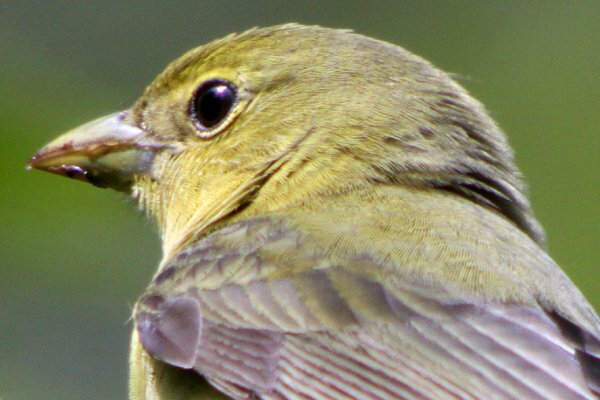 Nonetheless, I am still pretty happy with these shots, the best I have gotten so far of a female Scarlet Tanager. Amazing how much female Scarlet Tanagers look like female Western Tanagers. But the species is in fact named for the female plumage, so she gets some credit! @Rick: Can you think of any other species that have this kind of gendered split between the scientific and common names? There are actually bunches of them; it’s a fun thing to collect. “No one pays attention to female Scarlet Tanagers” as soon as they have seen their life Summer Tanager. 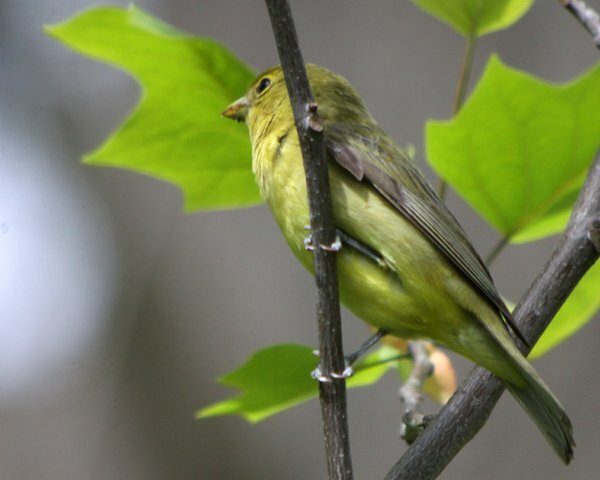 You have no idea, not a hint of one, how much scrutiny I applied to female tanagers at Point Pelee in 2005. Until I saw an immature male. Then I switched to trying to find Yellow-crowned Night-herons. I fell in love with this bird. Such a beauty. Fragmented forests in the Northeast have not served them well. I have found 2 dead females late Sept. in front of glass building in Wash, Dc. so sad. 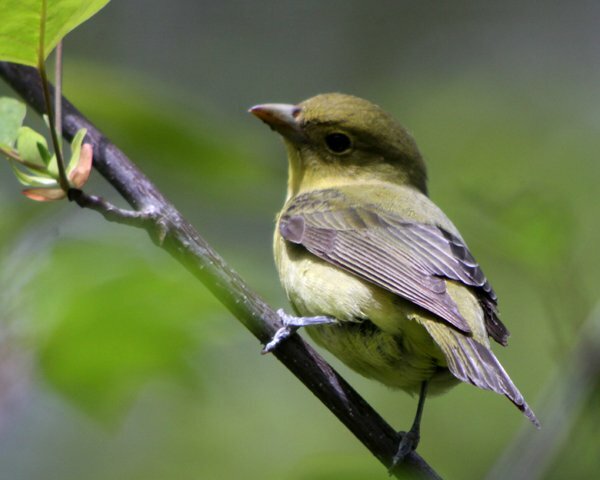 We live in Crystal Lake Illinois and have had Orioles all week since we put out the oranges but this morning awoke to find a scarlet tanager and then realized that we’ve had the female all week but didn’t know who she was.